A little over a week ago I proclaimed Hollow Knight to be the perfect summer game. That article was originally going to be a list of the best games with which to cool off, but due to time and energy constraints it became just about the game in the top spot. Little did I know that Nintendo already beat me to the idea in an advertisement on the Switch eShop. 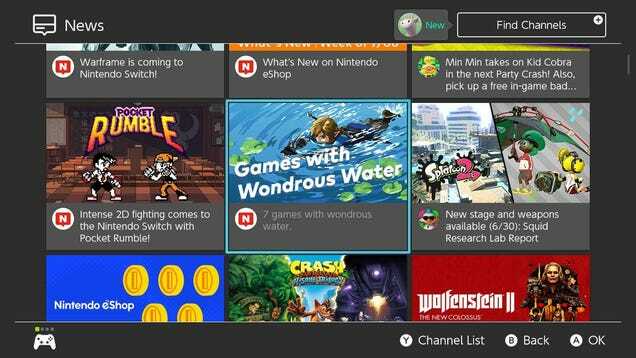 The blurb is titled “Games with Wondrous Water,” and contains Nintendo’s selection of games to help beat the heat. I thought it would be fun to see which games Nintendo chose, and whether they would have made it onto my list of the best games to play during summer. Oh, starting off very strong, Nintendo. I’ve already gone on about this one a couple times, but here’s a reminder: this game is freaking incredible. There are quite a few muggy jungle levels in the early game, but later on there are plenty of dark, rainy, or chilly levels to refresh you in these months of hell. The best level for this purpose would probably be 5-6: Frosty Fruits, on account of its ice-cold atmosphere and focus on tasty frozen treats, but there are plenty of others to keep you cool. Excuse me while I go buy some popsicles. Well, this is certainly a very “chill” game, but not necessarily in the way that I’m looking for. There is water, sure, but you don’t interact with it for the most part. It’s something to be avoided, an obstacle to be crossed. Still, there are cool areas like the rainy Akkala or any of the snowy mountain ranges to reduce your sweltering misery, so it isn’t a completely terrible entry. Alright Nintendo, I’m on to you. You’re just plugging all of your big games at this point. I wouldn’t say many of the environments in this game are great at cooling you off, save the Lake Kingdom or the Snow Kingdom. Since those are two of the weaker worlds in Mario Odyssey though, this entry is looking like something of a reach. The Deep Woods are also pretty comfortable, I suppose. Another mediocre entry (as part of the theme, the game is phenomenal), but I’ll give it a pass for it’s excellent water themed world: 20,000 Lums Under the Sea. It’s dark, atmospheric, and almost entirely composed of water levels. The rest of the game doesn’t really work with the list, but at least it’s something. This is the only game on the list I haven’t played. I assume there’s a water level in there somewhere? Maybe one where you turn into a submarine? Really all I know about Yooka Laylee is that it was disappointing. Not a good sign for the quality of this list. Whelp, overall this wasn’t a great list. Not only were most of these not applicable to the theme, but Hollow Knight was nowhere to be found! Yes, I know the theme was technically “games with water,” and no, I don’t care. The games on this list are certainly worth your time, but they won’t help you forget how much you hate the sun.